Mother’s day is on 12th May 2013. Once again, its that special time of the year when we thank our Mother’s for all their pain staking effort in raising us and constantly caring for us. The pain, heartache and joy they deal with everyday is unbelievable. So to make this day a little extra special and commemorate Mother’s Day in our own signature way Tajonline.com brings you its Mother’s Day Early Bird offer! All you need to do is use the code earlybirdmday2013x9y while placing an order for Rs.799/- and you get a amazing discount of Rs.99/- FLAT OFF. Every Mom deserves to be pampered and showered with gifts on this special day and everyday ! 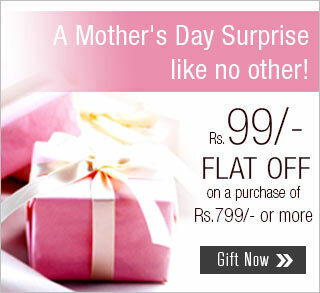 So, go ahead and choose your special gift from our hand-picked collection of Mother’s Day. So what are you waiting for? Be the first one to send your Mom a special gift as precious as her. ← From Gudi Padwa to Ugadi, it’s a Happy New Year all around!